How do I create an external BOM from a drawing? Starting from a drawing containing single part or main part details, Advance Steel can create an external BOM, based on a template chosen by the user. This external BOM will contain only the elements from this drawing. To create an external BOM, a single part / main part / main part with single part details drawing is required. 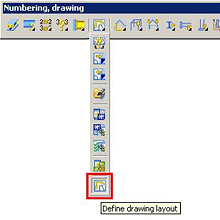 This feature cannot be used for overview drawings. 1. Launch the "Define Drawing Layout" command. 2. 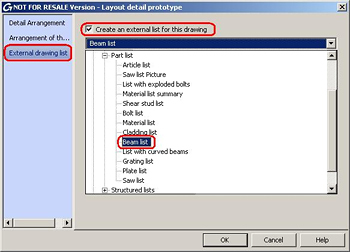 Select "External drawing list", then check the "Create an external list for this drawing" option. Choose a BOM from the list below. 3. Click OK to apply the settings and close the dialog box. 4. Update the lists using the "Update lists" function. The external BOM file (in .rdf format) is saved in the same folder with the drawing, with the same name as the .dwg file. You can obtain an external BOM and a BOM from the drawing using different templates. The "Update lists" function will apply to both files at the same time.